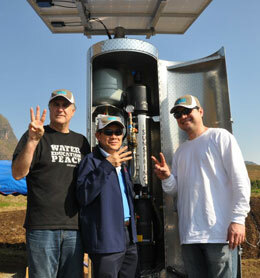 Jon Kaufman, left, and team members hold up three fingers, signifying water, education, and peace, during the installation of a SunSpring. When we launched our club’s project, H2OpenDoors, we said that the world’s water crisis can be solved with a little technology and a whole lot of soul. With our first two installations completed at two hill tribe villages in Northern Thailand in February 2013, we are now preparing for the next in Myanmar. Working with District 3360 in Northern Thailand, we’ve identified a high school 17 kilometers north of the Thai border where 2,000 Burmese students and 40 teachers use coffee filters to strain the contaminated water from 100-year-old cisterns and wells. In as little as four hours, we will install a new SunSpring system which will provide up to 19,000 liters of 99.99 percent pure water from these polluted sources each and every day for ten years. The school will have enough to start selling the surplus water, creating a means in which to support the improvement of hygiene and sanitation at the school. As the name of H2OpenDoors suggests, there are two tracks here. OpenDoors speaks to opportunity, including the women of the villages who form water councils to take proprietorship of the systems and the new social business. But we also provide opportunities for our own local high school kids, as we brought two students and their teacher with us on our installation expedition in February. We are expanding this to four students and two teachers as we set out for the Myanmar and Chiang Rai expeditions. Our first two SunSpring installs are serving over 9,000 beneficiaries a day. Now, just imagine if just 1 percent of all the Rotary clubs used the H2OpenDoors model this year, 340 clubs providing a water system that serves 9,000 people every day for 10 years. That’s over 3 million people that would not die of waterborne disease annually. The global water issue can be solved in a fraction of the time it has taken to tackle other world problems. This entry was posted in Providing clean water and tagged environment, Thailand, United States by Rotary International. Bookmark the permalink.